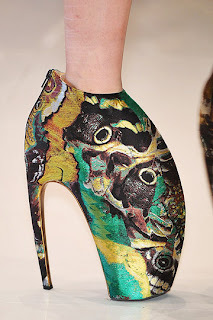 The shoes at the Alexander McQueen Spring 2010 runway show were pretty incredible to say the least. I'm still having a hard time trying to describe them..they seem kindda lobster-claw like/animal hoof. They towered at a mere 10 inches, can you imagine trying to run after a cab in these babies--yikes! There's no doubt that they're a work of art...but would you actually wear them?